VegSource.com :: International Portfolio :: PRO IT Service S.R.L. - Choose a professional and accessible service for your online image! Vegsoure.com is a movable type community Web site about vegetarianism that I've invested a lot of energy and soul to build up. Jeff Nelson tried to get his project done with somebody else and being unhappy with the result, he found me as one of the most reliable movable type developers. He trusted by skills and wanted to have me build up his project. 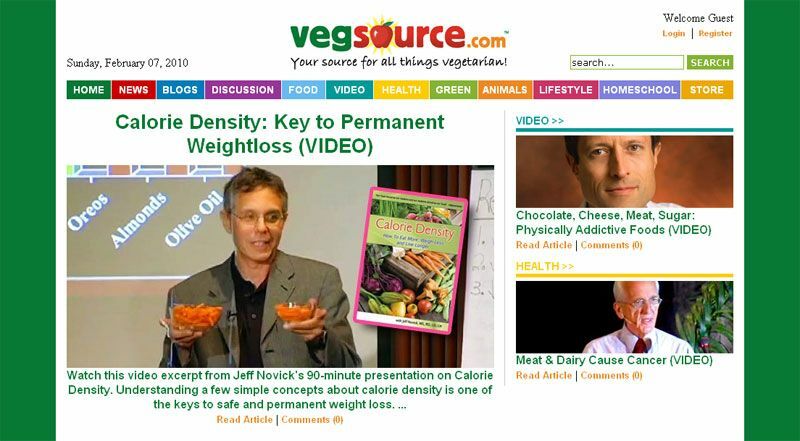 I recall those long emails I've received from Jeff Nelson regarding his vegsource.com project. As a web site developer since 1997 and a movable type consultant since 2002 I could easily understand the technical complexity behind all kind of Websites features. So right after reading the vegsource.com specifications everything seemed pretty precise in my mind. Jeff had the website layout already in web page format, but after starting to work on the movable type development, I've noticed that the layout was kind of done with the feet so I've recommend him that we recode some parts of it in a professional manner. Said and made. What I've enjoyed about this project was the fact that it was organized into 3 components. The first section was meant to be called "blogs" and to allow Jeff, his wife, as well as bunch of internal experts to be able to post blog articles. 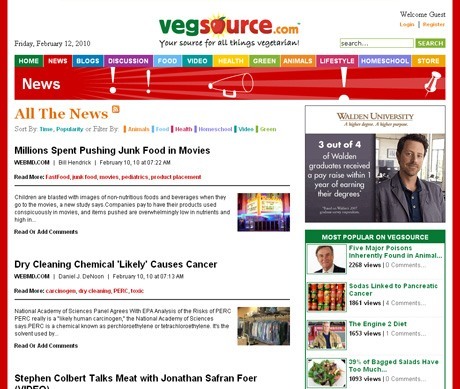 The second section was meant to be called "news" and it was also for a number of selected vegsource.com users that were allowed to post there news stuff. 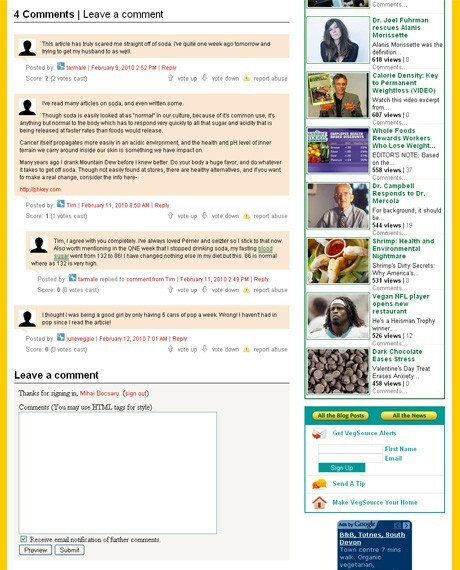 This area was for any person who wants to be able to post stuff on vegsource.com. Basically, this was a separate section where people could register to and right after could contribute with articles. After registering, users get automatically permission to post articles to the "community" section, as well as to post comments to all the 3 sections (blogs, news and community). Outside the above mentioned sections, there is also a series of tabs which aggregate content from across both the "blogs" and the "news" section on specific verticals such as: Food, Health, Green, Animals, Lifestyle and Homeschool. The challenge here was to impose this precise set of permissions to any user that registers to the site. In order to allow this, I had to write a custom movable type plugin which to define these roles. 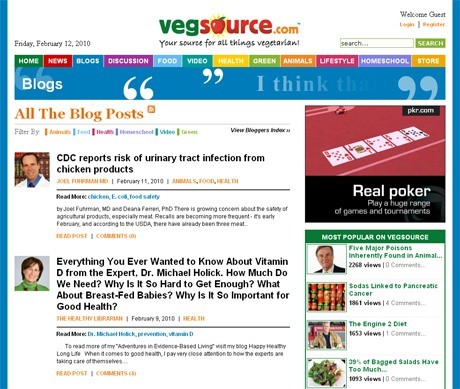 At the beginning, any articles sent to the community section by a community user are in draft so that a vegsource.com internal resource could check it and make sure it's proper for publication. After building some trust, an internal resource could promote a community user to be able to publish articles to the community section without moderation and with the time possibly even to publish stuff to the news section. What's exciting about the comments is that people could reply to other people comments and that the replies are displayed in hierarchy order. The visitors could also rate comments, by voting up or down, as well as report abuse in case a comment is considered offending or just spam. Last, but not least, when publishing a comment one could subscribe to receive an email notification of any further comments. This is an excellent technique to engage a conversation on each article. 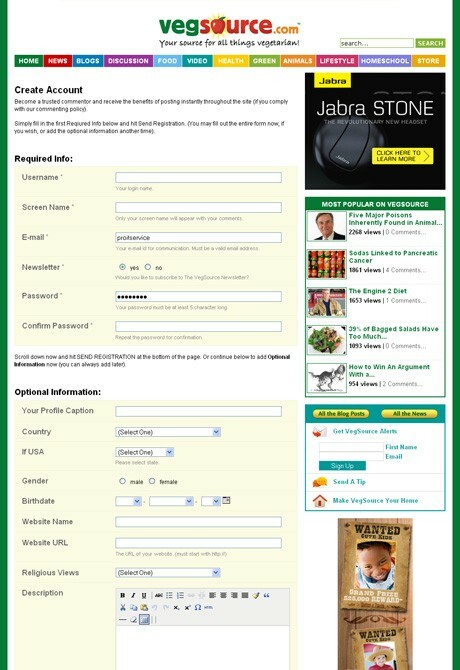 Jeff wanted to gather more information from those visitors that register to the site. We've defined 18 custom fields, from checkboxes to input fields, drop down menus, date fields (with a calendar function) and textareas. The challenge here was to split all these custom fields into section, such as "Required Info", "Optional Information", "Personal Information" and "Bio Info" and to display the fields in a specific order. Another nice aspect was to integrate a calendar function which to allow users to pick up their birth date, as well as to integrate a WYSIWYG editor for textareas. This development was shared by the "registration" and the "edit profile" functions. The member profile page displays most of the information collected during the registration page, as well as some other data, such as his/hers recent activity (recent comments, recent responses to comments and recent posts). Movable Type "Add Blog Entry"
As mentioned above any person who registers to the site is allowed to add an article at a time to the "community" section, currently called "Discussion". There is a link called "Add Blog Entry" which displays on the community section sidebar, but which shows up only when the visitors is logged in. 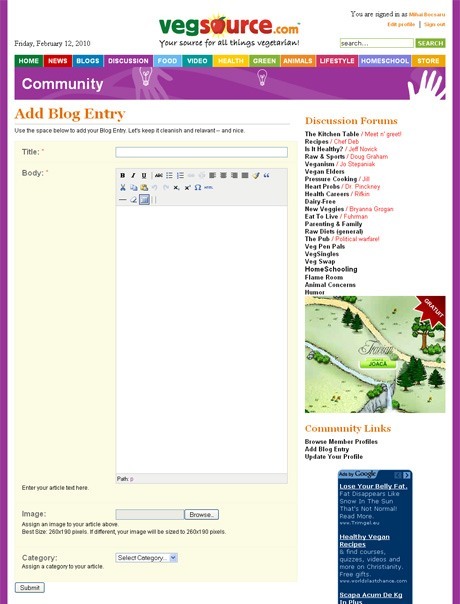 But one won't be able to use the community "Add Blog Entry" form unless sHe is logged in. Instead, the following text would show up "Sign in to create an entry." linked to the "Sign in / Registration" page. With the time we've realized that it would be better to leave the "Add Blog Entry" link displayed on the community section sidebar even if the user is not logged in, because this way somebody who wants to contribute to the site would be able to figure out that for being able to contribute sHe has first to register to the site. Together with the article title, text and category assignment, one could also publish an image to be associated with his/hers article. We've thought about giving users the possibility to format the text they provide for their Web site profiles (during the registration phase or the edit profile function), or the text of the articles they might want to send to the community section. Worth mentioning is also that the Website is tracking each visit and in one hand it displays the number of visitors for each article in the movable type admin, and on the other it produces a widget called "Most Popular On VegSource" and displays it all around the Web site. Do You Need to Develop a Community Web site? If you need similar community development I would be delighted to develop your project! Are you still undecided on who should work on your project? As well as under our the Testimonials section. Contracting from Mostly Magic, Inc., California, U.S.A.